If I was to use flaMe 1.27 will it bring all evil to earth or can I use this so archaic yet so willing to work for me program? Of course I ask, so my maps would work too. No output format changes that recently. I am not sure about the answet NoQ, I think a comma is missing. You mean - no fear, something bla bla changes it recently, so create with 1,27? Something i am doing wrong. When i copy a quarter of my map (for example in a 160/160 size at x/y point 80/80) clockwise, the x/y-coordinates changes by 1. So-should i rotate at point x=79 y =80 or x=80 y = 79 or both 79? I like it how through time NoQ have found perfect ways to visualize problems and solutions to very often quite similar questions on the forum instead of numerous lines of the text. NoQ I am still not sure if I can still simply make a map with 1,27 please? Jab, you are right, Merowingg. Now i finished to read this whole thread but i still have some questions. But i have no desire to bore this topic. In Montenegro we say: " The best way therefore to learn how to swim fast, is first to learn how to swim slowly." I had a sleepless night because of the question above. The solution to the problem is so simple. I should have solved this problem by myself. Anyway-Thank you very much, once again, for your and NoQs support. Horrible. I try to made a new wall with Rockie tile number 27. Changing to cliff-face. And that is the result in the triangels.... the units try to climb up. They could not. It is only the first step. Trying out all the other tiles i saw, that is the same. It is not the same as the usual clifffaces. But it makes the game unplayable in near battlefights. What happens here? I think I know what's happening here as I encountered this myself and had to solve it to do what I wanted to with "Earthworks" in "New Pangaia SP". When you change a non-cliff tertile to cliff you will encounter this effect if you use a brush that makes use of that changed tertile among others that remain non-cliff in the render matrix thus creating a brush mix that is both cliff and non-cliff. Until "Sharp FlaMe" is developed to be able to make custom brushes there is but one work-a-around: the non-cliff tertile you have re-assigned to cliff has to be applied tile by tile (no brush) and you can no longer use the brush which makes use of it in it's heterogenous render matrix or you will get this result - the mixing of cliff and non-cliff. Hope that makes sense and helps with your efforts. I didn`t mix. I put tile by tile as cliff-face. But i solved the problem now. Just using tile 65 as cliff in front of the wall (angle 15). Don`t use this tile anywhere else. No influence in the game. It works. However-that could not be the solution. Thanks for your answer. Then, in-game, units won't try to go up/down them. It will still look like it does in your picture though. 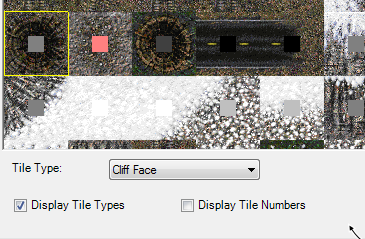 If you wanna re-assign cliff to non-cliff tiles that are also used in hard-coded brush mixes then my first post explains how to do it and achieve a wide variety of cliff visuals without creating PF/PW anomaly conflicts and so my reiteration here rather than let it go as the original post had no utilitarian value going forward for other map makers, as seems the direction this has otherwise landed. Now, if my explanation is still lacking towards full comprehension, i'd be willing to give it another shot as to my knowledge, this significant issue has not been addressed anywhere else. 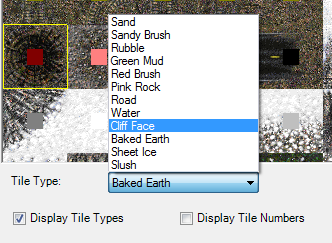 Any tiles which you specify as cliff-face tiles cannot be travelled over by units (aside from VTOLs). The angle does not matter, a completely flat cliff-face still cannot be driven over.